As a kid, I was extremely fond of a series of biographies, largely fictional, I’m sure, that dramatized the lives of famous Americans — Washington, Jefferson, Kit Carson, Henry Ford, Thomas Edison, Daniel Boone — when they were children. (Boys, for the most part, though I do remember reading one about Clara Barton.) [I would think this is the COFA series.] One element that was almost universal in these stories was the vast amounts of time the famous historical boys were alleged to have spent wandering with bosom companions, with friendly Indian boys or a devoted slave, through the once-mighty wilderness, the Wilderness of Childhood, entirely free of adult supervision. Though the wilderness available to me had shrunk to a mere green scrap of its former enormousness, though so much about childhood had changed in the years between the days of young George Washington’s adventuring on his side of the Potomac and my own suburban exploits on mine, there was still a connectedness there, a continuum of childhood. Eighteenth-century Virginia, twentieth-century Maryland, tenth-century Britain, Narnia, Neverland, Prydain — it was all the same Wilderness. Those legendary wanderings of Boone and Carson and young Daniel Beard (the father of the Boy Scouts of America), those games of war and exploration I read about, those frightening encounters with genuine menace, far from the help or interference of mother and father, seemed to me at the time — and I think this is my key point — absolutely familiar to me. The thing that strikes me now when I think about the Wilderness of Childhood is the incredible degree of freedom my parents gave me to adventure there. A very grave, very significant shift in our idea of childhood has occurred since then. The Wilderness of Childhood is gone; the days of adventure are past. The land ruled by children, to which a kid might exile himself for at least some portion of every day from the neighboring kingdom of adulthood, has in large part been taken over, co-opted, colonized, and finally absorbed by the neighbors. What is the impact of the closing down of the Wilderness on the development of children’s imaginations? This is what I worry about the most. I grew up with a freedom, a liberty that now seems breathtaking and almost impossible. Recently, my younger daughter, after the usual struggle and exhilaration, learned to ride her bicycle. Her joy at her achievement was rapidly followed by a creeping sense of puzzlement and disappointment as it became clear to both of us that there was nowhere for her to ride it — nowhere that I was willing to let her go. Should I send my children out to play? There is a small grocery store around the corner, not over two hundred yards from our front door. Can I let her ride there alone to experience the singular pleasure of buying herself an ice cream on a hot summer day and eating it on the sidewalk, alone with her thoughts? Soon after she learned to ride, we went out together after dinner, she on her bike, with me following along at a safe distance behind. What struck me at once on that lovely summer evening, as we wandered the streets of our lovely residential neighborhood at that after-dinner hour that had once represented the peak moment, the magic hour of my own childhood, was that we didn’t encounter a single other child. Even if I do send them out, will there be anyone to play with? Art is a form of exploration, of sailing off into the unknown alone, heading for those unmarked places on the map. If children are not permitted — not taught — to be adventurers and explorers as children, what will become of the world of adventure, of stories, of literature itself? Back when Chabon had a website, which I remember a year or two ago, he had a very good piece on kids, Lego, and imagination. Here’s where it was, in 2006. Will have to see if I can use the Wayback Machine to get a better link. Aha. Try this. The New York Times‘s account of the arrival of a busload of paleontologists last week at the Creation unMuseum in Kentucky. The scientists received the group admission rate, which included lunch. 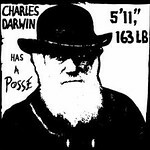 Many of the paleontologists thought the museum misrepresented and ridiculed them and their work and unfairly blamed them for the ills of society. “I think they should rename the museum — not the Creation Museum, but the Confusion Museum,” said Lisa E. Park, a professor of paleontology at the University of Akron. The museum, he realized, probably changes few beliefs. “But you worry about the youngsters,” he said. Dr. [Tamaki] Sato [a professor of geology from Tokyo Gakugei University in Japan] likened the museum to an amusement park. “I enjoyed it as much as I enjoyed Disneyland,” she said. “Not very much,” she said. and there’s a good listing at Natural History Museums by Location, brought to you by Paleoartisans. Don’t get him started. “The Internet is a big distraction,” Mr. Bradbury barked from his perch in his house in Los Angeles, which is jammed with enormous stuffed animals, videos, DVDs, wooden toys, photographs and books, with things like the National Medal of Arts sort of tossed on a table. Read the rest of the article here. For a different view, here’s a January 2009 post on closing the library from the Ventura City Manager’s blog. Once a month the Smithsonian’s Lemelson Center for the Study of Invention and Innovation sends me an email newsletter, and once a month I think, oh! I should mention that here. This month, I’ve remembered. Pick up Fenster’s book and find out about the improbable and little-known career of Robert Switzer, a Berkeley student who made a hobby of magic tricks. In 1932, an accident in a part-time job at Safeway put him into a coma, from which he slowly recovered in an unlit room. To amuse himself in this darkened convalescence, he played with the spectacular rainbow emissions from fluorescent rocks. Turning on another light in his mind, this led to his invention of glow-in-the-dark paints that he and his brother marketed at first to magicians. Soon after, dropping out of college, the Switzers discovered a way to use ordinary sunlight to bring out fluorescent colors — DayGlo, patented in 1947. The Lemelson website has a page of Resources, including educational multimedia and print materials for classroom use, invention stories, the invention archives at the National Museum of American History Archives Center, and lists of invention-related books and websites. There’s also a page for video clips and podcasts; one of the recent podcasts is an interview with Julie Fenster about her new book, The Spirit of Invention, and one of our favorite podcasts (in two parts) is an interview with biographer Walter Isaacson on Benjamin Franklin’s contributions to democracy and technology. On the same page, you can find a link for a PDF podcast activity guide. This month the New York Review of Books has published an anniversary edition of The One-Straw Revolution by Masanobu Fukuoka (1913-2008), about natural farming and permaculture, originally published in 1978 by Rodale Press. The new edition has an introduction by Frances Moore Lappé (Diet for a Small Planet) and a preface by Wendell Berry. Michael Pollan calls the book “one of the founding documents of the alternative food movement, and indispensable to anyone hoping to understand the future of food and agriculture”. One of the book’s translators and editors, Larry Korn, a student of Masanobu Fukuoka, is beginning a book tour of Washington and Oregon to celebrate the new edition. The Fukuoka Farming Website includes a number of sustainable farming resources. For 30 years I lived only for my farming and had little contact with people outside my own community. During those years I was heading in a straight line toward a “donothing” agricultural method. The usual way to go about developing a method is to ask “flow about trying this?” or “How about trying that?”…bringing in a variety of techniques, one upon the other. This is modern agriculture and it only results in making the farmer busier. My way was opposite. I was aiming at a pleasant, natural way of farming…which results in making the work easier instead of harder. “How about not doing this? How about not doing that?”—that was my way of thinking. By taking this approach, I ultimately reached the conclusion that there was no need to plow, no need to apply fertilizer, no need to make compost, no need to use insecticide! When you get right down to it, there are few agricultural practices that are really necessary. The reason that man’s “improved” techniques seem to be necessary is that the natural balance has been so badly upset beforehand by those same techniques that the land has become dependent on them. Make your way carefully through these fields. Dragonflies and moths fly up in a flurry. Honeybees buzz from blossom to blossom. Part the leaves and you will see Insects, spiders, frogs, lizards, and many other small animals bustling about in the cool shade. Moles and earthworms burrow beneath the surface. This is a balanced ricefield ecosystem. Insect and plant communities maintain a stable relationship here. It is not uncommon for a plant disease to sweep through this region and leave the crops in my fields unaffected. And now look over at the neighbor’s field for a moment. The weeds have all been wiped out by herbicides and cultivation. The soil animals and insects have been exterminated by poison. The earth has been burned clean of organic matter and micro-organisms by chemical fertilizers. In the summer you see farmers at work in the fields…wearing gas masks and long rubber gloves. These rice fields—which have been farmed continuously for over 1,500 years—have now been laid waste by the exploitive farming practices of a single generation. For centuries, farmers have assumed that the plow is essential for growing crops. However, non-cultivation is fundamental to natural farming. The earth cultivates itself naturally by means of the penetration of plant roots and the activity of micro-organisms, small animals, and earthworms. I had a very kind invitation by email earlier in the week from Persephone Books, which celebrated their 10th birthday today with a party in London I was unable to attend. And very sorry about that too, what with the promise of “champagne and cups of tea all day plus cheese scones for elevenses, salads for lunch, brownies and cupcakes for tea and canapés for the evening”. And Persephone is offering a special all week, for readers abroad as well: three books for the price of two. For international customers, “the third book will be sent surface mail even if the other two are sent airmail.” For those ordering online, write ‘free book please’ and the title of the third book in the Additional Info box on the website. Best of all, Persephone Books has (have?) a new blog, The Persephone Post. The Children Who Lived in a Barn by Eleanor Graham, published originally in 1938 and reissued in 1955; I’d heard lots about this but had never read it. Rather earnest and well before the end of the book you realize the children are behaving like adults and the adults like children. A nostalgic oddity. The Home-Maker by Dorothy Canfield Fisher, author of my beloved Understood Betsy; a 1924 adult novel about a wife and mother who is desperately unhappy at home with the children, and a husband and father who is desperately unhappy at work. Circumstances first tragic but then fortuitous allow them to change places, and DCF’s interest in the Montessori method is evident throughout. The Shuttle by Frances Hodgson Burnett; another adult novel by a woman known now primarily as a children’s author, and another work ahead of its time. An American heiress, Rosalie Vanderpoel, is wooed and wedded by an impoverished — and, we later learn, nasty and cruel — English aristocrat. In a delightful twist, her spunky younger sister sets out to rescue her. Because the novel was said to have been inspired by the true-life story of heiress Consuelo Vanderbilt, who married the Duke of Marlborough, after finishing The Shuttle I set off to read the double biography Consuelo and Alva Vanderbilt: The Story of a Daughter and a Mother in the Gilded Age by Amanda Mackenzie Stuart and Marian Fowler’s Blenheim: Biography of a Palace, quite the rabbit trail. But still think I might be interested in FHB’s The Making of a Marchioness. Few Eggs and No Oranges by Vere Hodgson; her “sparky and unflappable” diary account of World War II. The Country Housewife’s Book: How to Make the Most of Country Produce and Country Fare by Lucy Yates; all sorts of handy hints and recipes, including — for JoVE — how to skin a rabbit and how to make a haybox, which makes an appearance in The Children Who Lived in a Barn. Good Evening, Mrs Craven: The Wartime Stories of Mollie Panter-Downes by Mollie Panter-Downes; my favorite hands down of my selection. The stories are sometimes funny, sometimes tragic, but always moving and elegantly distilled. Next on my list are Minnie’s Room: The Peacetime Stories of Mollie Panter-Downes also from Persephone, One Fine Day probably from Book Depository, and working my through The Complete New Yorker on disc in search of all of MPD’s “Letter from London” essays (1939-1987). Down another rabbit trail, of interest to anyone who enjoys Jane Brocket‘s blog and books, the second issue of the Persephone Biannually (Autumn/Winter 2007) featured an article on her latest book, The Gentle Art of Domesticity, which included writings on “the literature of domesticity” in general and Persephone Books in particular. By the way, Jane is following up her last summer’s title, Cherry Cake and Ginger Beer: A Golden Treasury of Classic Treats from favorite children’s books with this summer’s Ripping Things to Do: The Best Games and Ideas from Children’s Books. No word yet if one of the ripping things includes making your own haybox. Scott Wiedensaul’s Of a Feather is more than a history of birding in America – it’s an excellent piece of American history, a gossipy (in tone but not in fact) look at ornithology and includes so many bits of society and culture that my head was spinning with glee as I read it. This will be front and center in the that feature on birding lit this summer at Bookslut. I need to remember to check back at Bookslut for that, since I know Colleen will have some great choices. Lisa Hamilton writes about being a traveler and witness in her essay for Powells. I just finished her book on three original farmers, Deeply Rooted and will be submitting a review for it for July. Every book on farming I read just makes me shake my head over how distance we have gotten from food and real life. It’s so odd to me how we watch Jon and Kate (and please – everyone has at least once) and that seems real to us. A staged show about a family is reality tv for families to watch. Why real farming and real food and real questions about both of those subjects (plus life and general) matter is what Deeply Rooted is all about. It’s very good stuff. Colleen, if it makes you feel any better, I’ve never seen Jon and Kate except on magazine covers at the checkout counter. One of the benefits of having (and, until the antenna is fixed, having had) only two TV channels! * after doing some more catch-up reading, I see there is now a distinction between “book bloggers” and “lit bloggers”. Heavens. Will need to give this some wine-soaked thought.